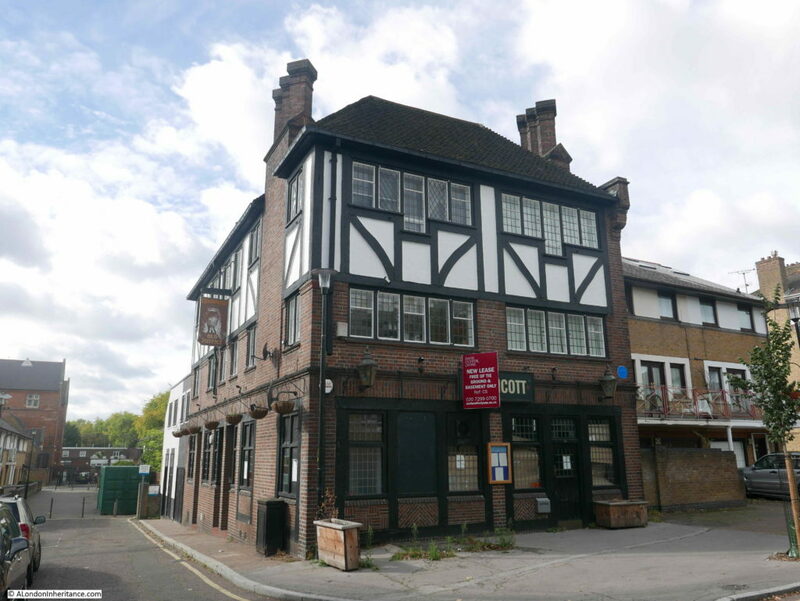 The location for this week’s post is a bit of a mystery. 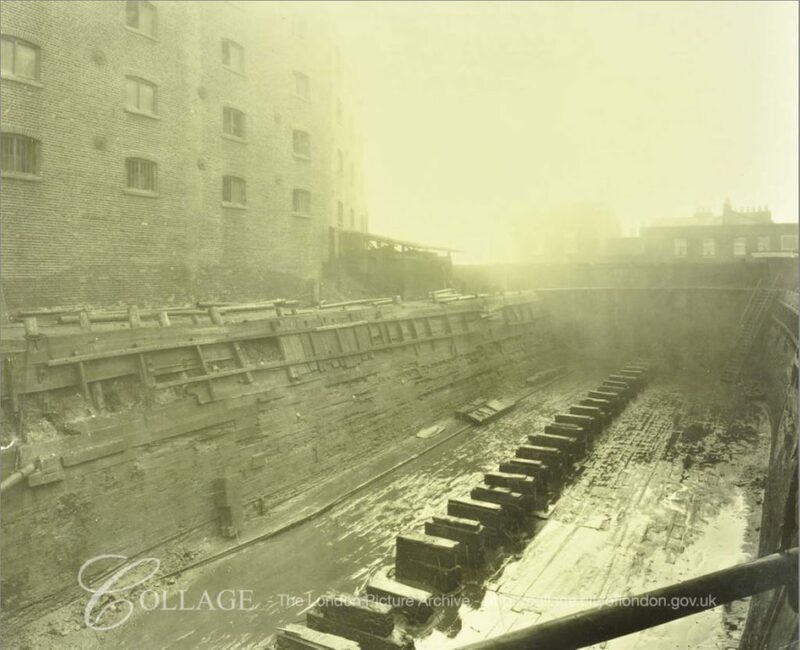 The notes my father wrote for the following photo were “Flockton Street looking south from Bermondsey Wall. 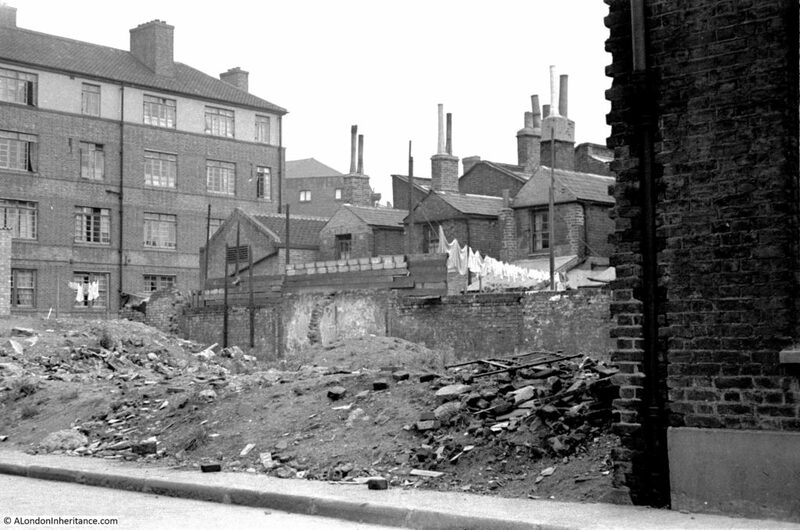 19th century slum dwellings ravaged by the blitz – Summer 1948”. I will explain why this photo is a bit of a mystery as I go through the post, but firstly, where was / is Flockton Street? The location is on the south of the River Thames, east of Tower Bridge. 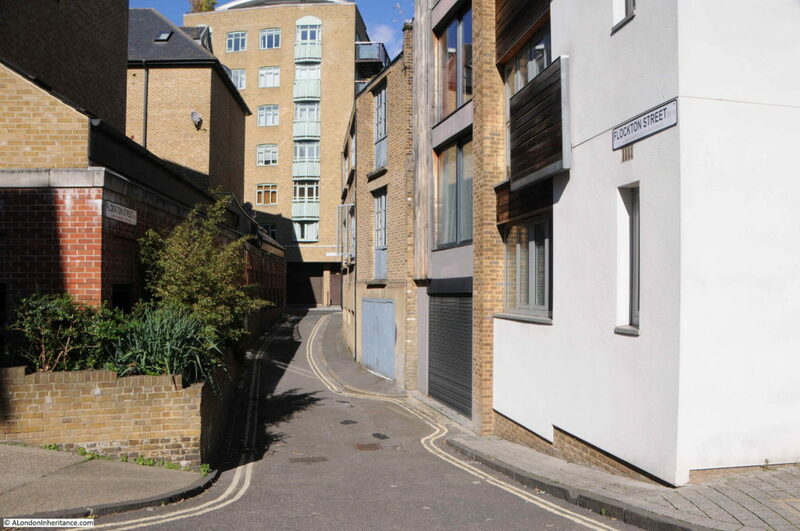 The street ran south from Bermondsey Wall, a short distance to the east of St. Saviour’s Dock. 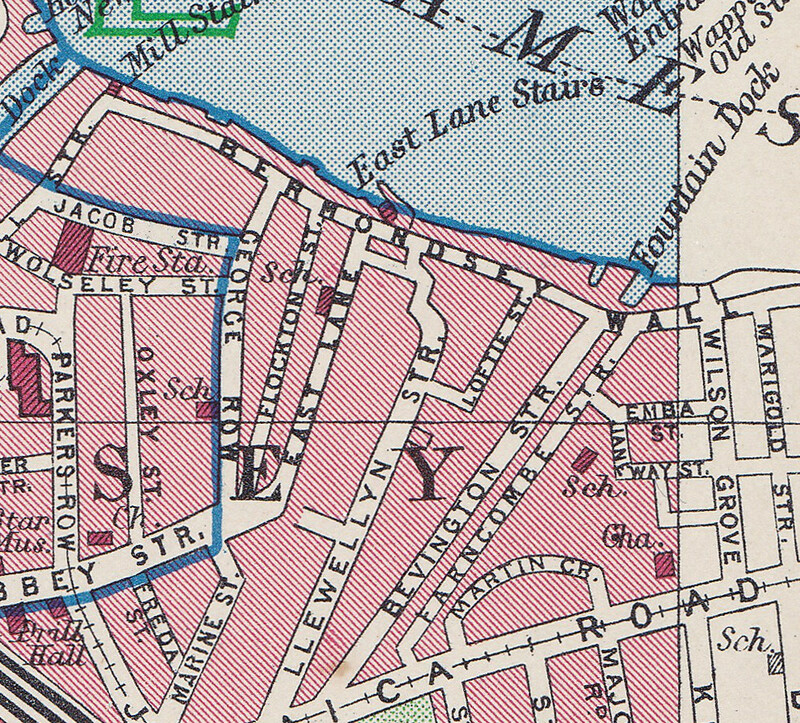 The following extract from the 1895 Ordnance Survey map shows the location. I have rotated the map so north, and the River Thames is at the bottom of the map and south at the top of the map. This rotation is to align the map with my father’s photo. So far, all looks good. I have marked the position from where I assume the photo was taken, and Flockton Street is the street running upwards from the red circle. My father’s photo is looking along a street with housing either side (although not as much housing in the map close to the camera as there is in the photo). The space on the right of the photo could be the location of the slate works shown on the 1895 map. In my father’s photo there is a taller building on the left, behind the terrace houses. 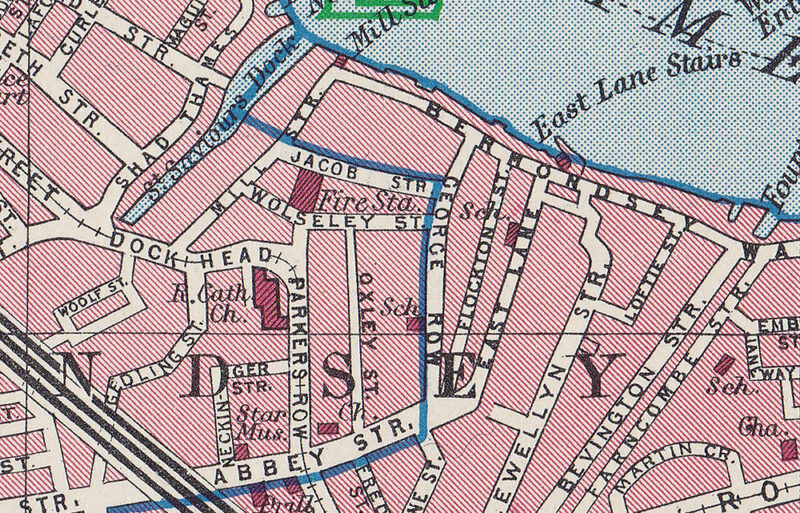 In the 1895 map, roughly where this building would have been located there is a school, and the limited view of the building in the photo does look like a typical Victorian London school. But when I went to find the site, I started to have doubts. 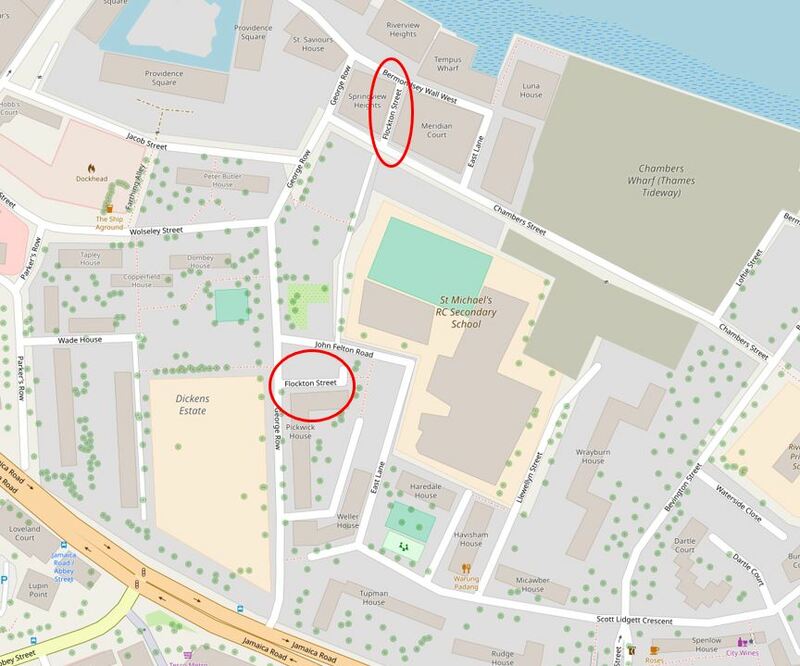 I have circled one stretch of Flockton Street at the top of the map. This stretch meets Bermondsey Wall at the top of the map, and presumably the point from where my father took the photo. At the other end of this short stretch is Chambers Street, a street that did not exist in 1895. I have circled the next identifiable stretch of Flockton Street in the middle of the map. This is a short length from George Row that also did not exist in 1895. 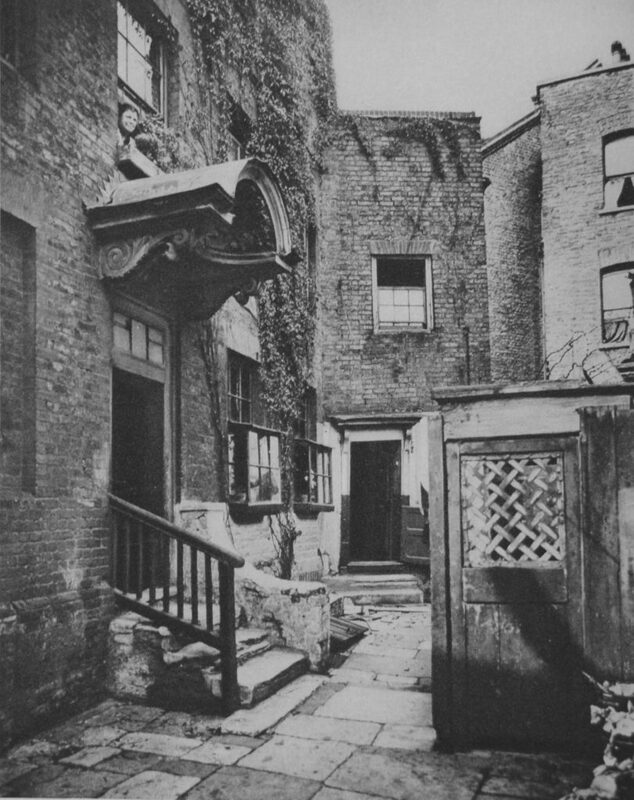 Flockton Street in its original alignment has all but disappeared, although there is what appears to be an unnamed street running from Chambers Street roughly where Flockton Street would have been, although today this is more a walkway in between the flats that now cover the area, rather than a street. Whilst walking around the site of Flockton Street, there were two main issues with confirming it was the location of my father’s 1948 photo. 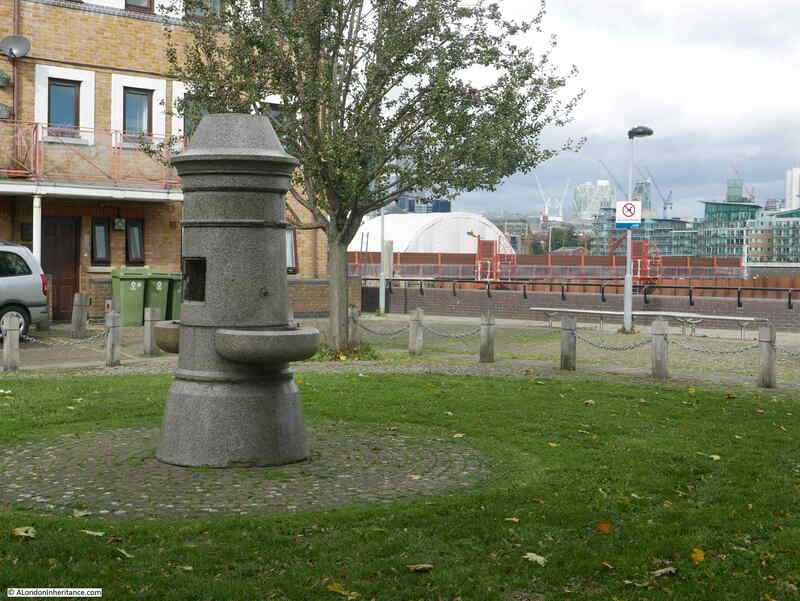 The first is the short stub of Flockton Street where it joins Bermondsey Wall. 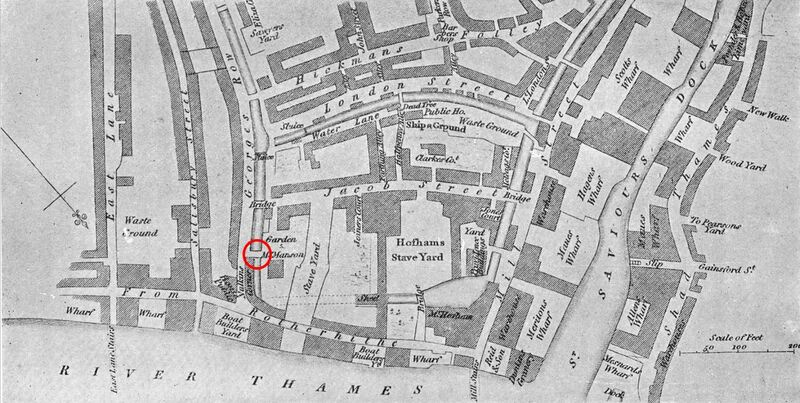 Bermondsey Wall is an old street, that as its name implies was at one time aligned or part of the wall / embankment along the edge of the river. I am not sure when the name Bermondsey was used for the street, in Rocque’s map of 1746 it is called Redriff Wall for the section just east of St. Saviours Dock, then Rotherhithe or Redriff Wall for the rest of the street (Redriff was one of the earlier names for Rotherhithe, hence the alternatives shown on Rocque’s map). Flockton Street is also not the original name. 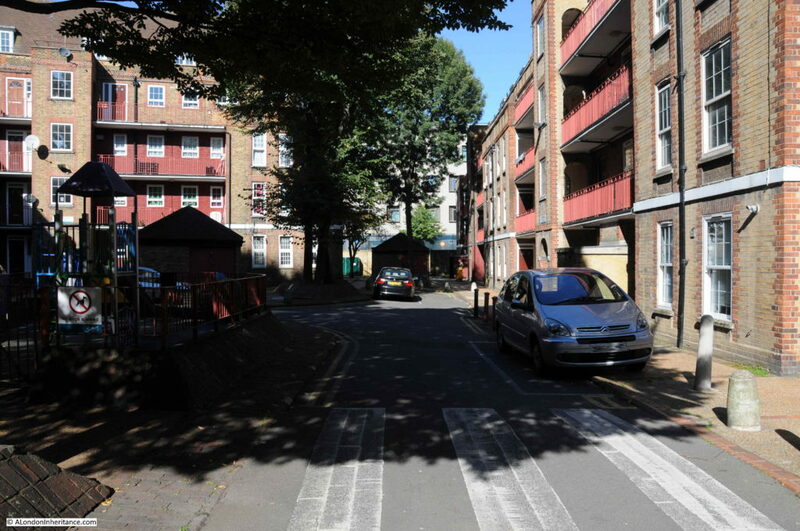 The London Evening Standard on the 8th August 1878 reported that “Salisbury Lane, Neckinger Road, Bermondsey will be renamed Flockton Street and also renumbered”. There is no additional information to explain why the renaming was needed, or why the name Flockton was chosen. The only person named Flockton that appears in 19th century newspapers is a Thomas Flockton of Leadenhall Street who was a shipping and insurance broker. Today, Bermondsey Wall has been divided into two sections (with the addition of east and west to the street name) by the works for the Thames Tideway Tunnel. 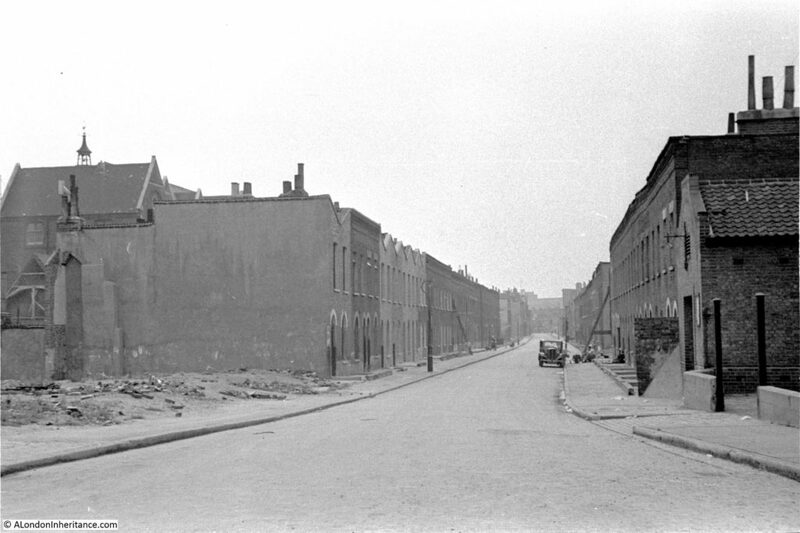 In the following photo I am standing in Chambers Street looking down Flockton Street towards Bermondsey Wall. 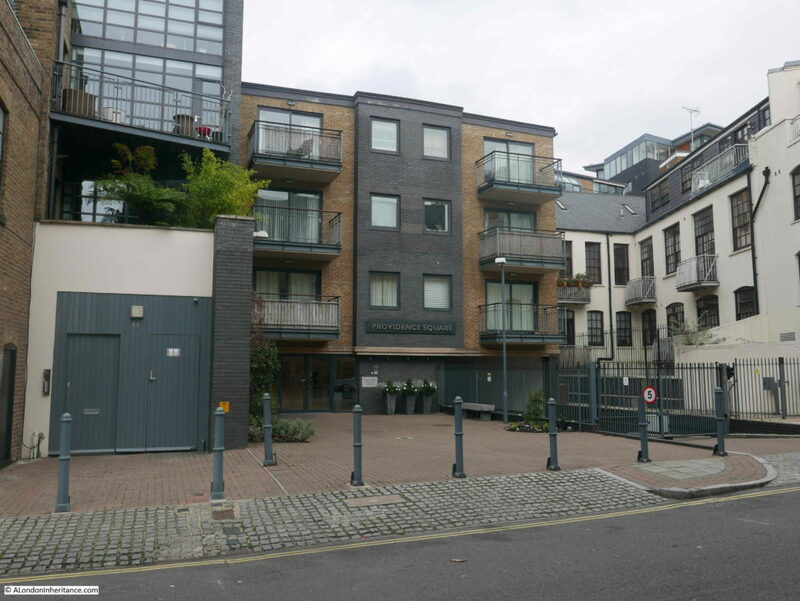 And in the following photo I am at the Bermondsey Wall end of Flockton Street looking in the direction of my father’s photo. There is a significant difference between my father’s photo and the above view. 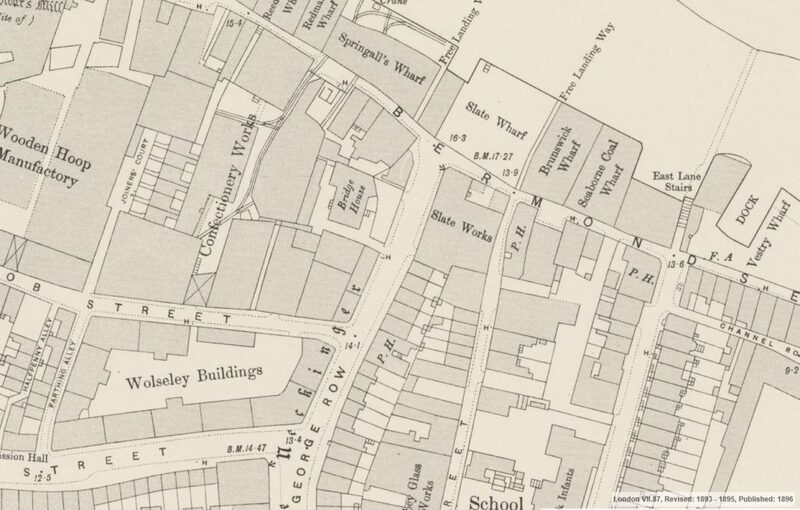 The street is very narrow (as confirmed in the 1895 map) and there is a significant dip in the street unlike my father’s photo which shows a much broader, flat street. 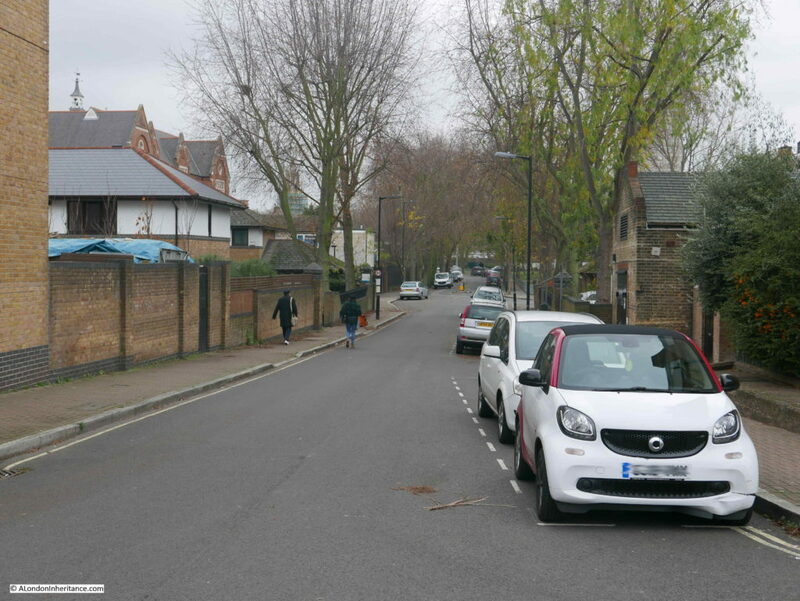 The dip in the street is significant as this hints at the undisturbed nature of this section of Flockton Street. 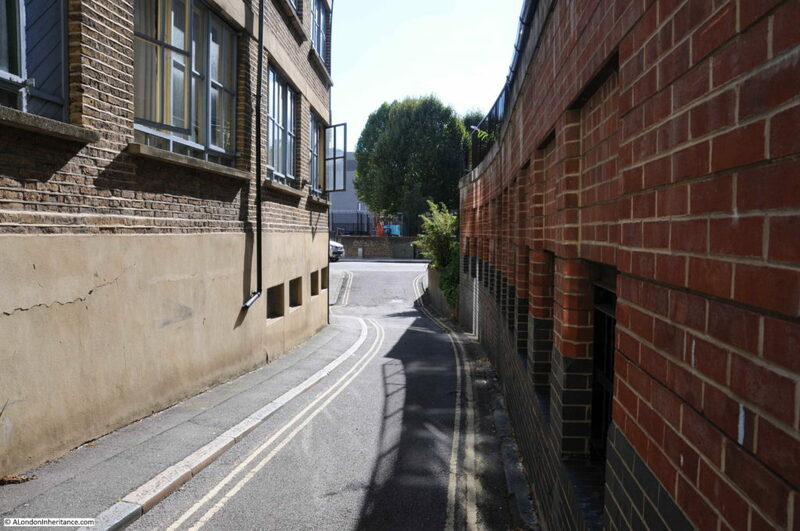 The dip in this section of Flockton Street is therefore the evidence for a deep 19th century drainage channel. It does not appear in my father’s photo. 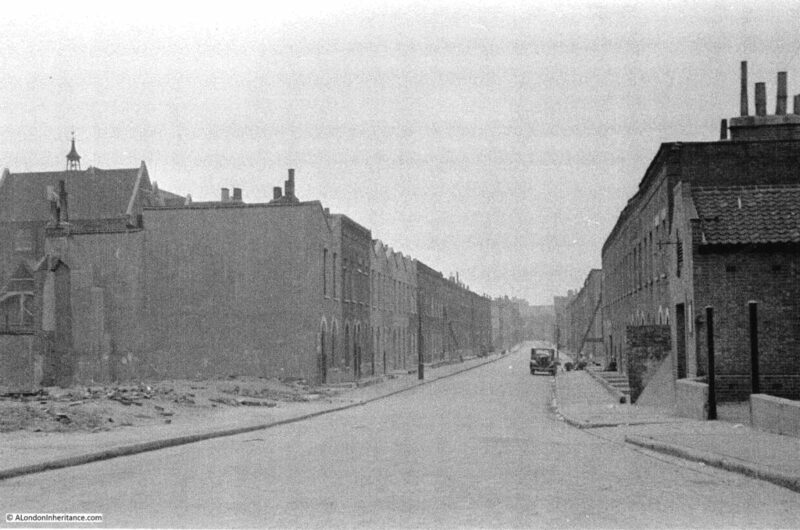 My next thought was whether the 1948 photo was taken from Chambers Street looking along Flockton Street, rather than from Bermondsey Wall. I checked the 1940 edition of Batholomew’s Atlas of Greater London and Chambers Street was not there in 1940. 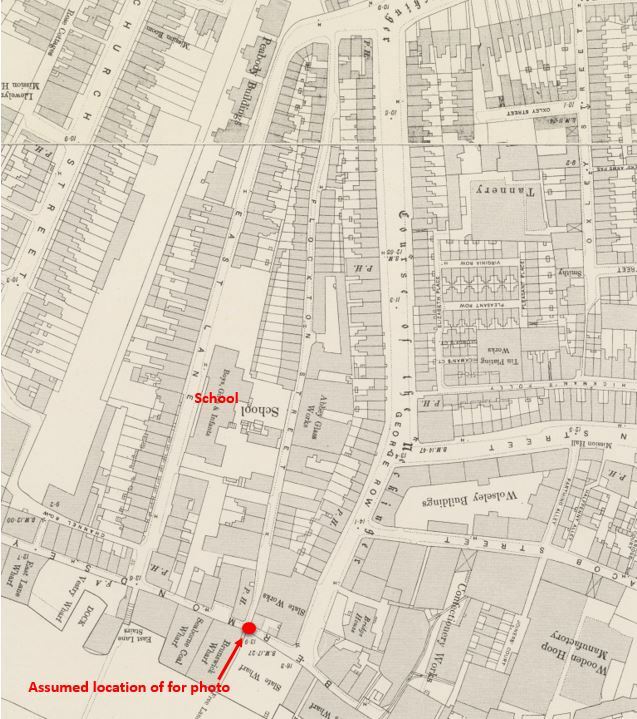 The following extract shows Flockton Street (just to the right of centre of the map) running up to Bermondsey Wall. The 1940 map does show the school in the same possible as in 1895 and in the right position as regards the 1948 photo. I doubt that Chambers Street would have been built between 1940 and 1948. Walking to the other side of Chambers Street, opposite the entrance to the small stretch of Flockton Street is this view. 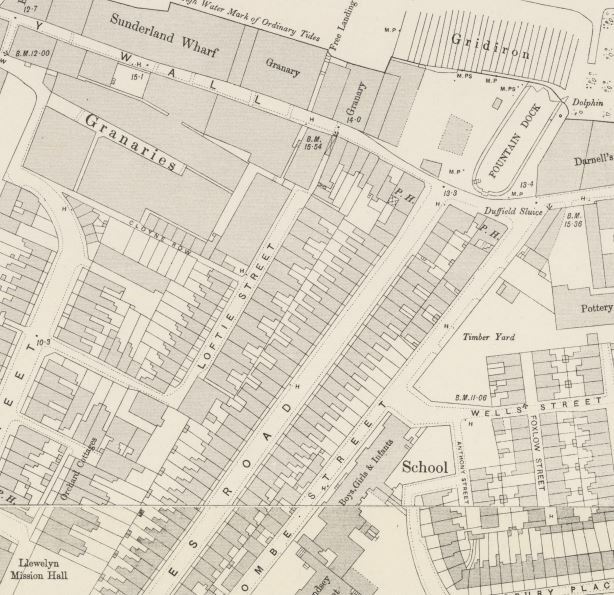 This is looking along where Flockton Street was on the 1895 Ordnance Survey map. 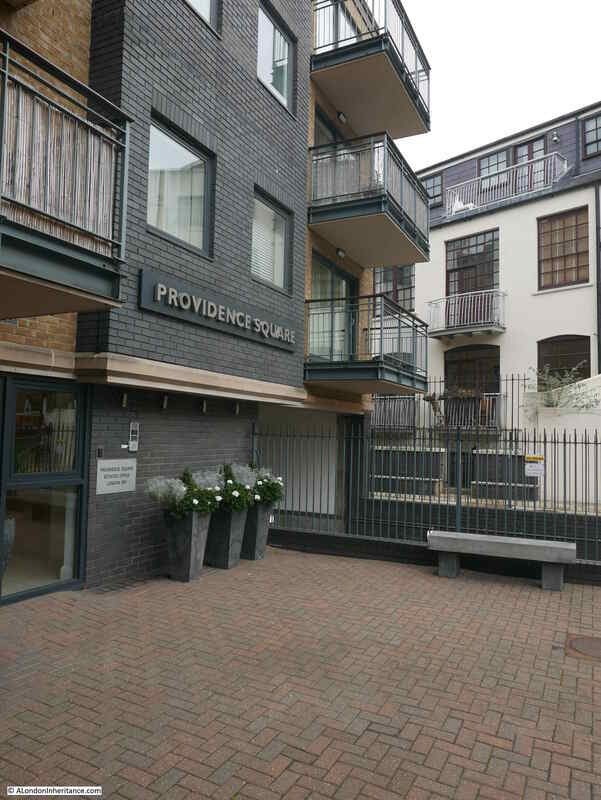 In this lower part of Flockton Street, there is an open area on the left and the new school buildings that have replaced the Victorian building. 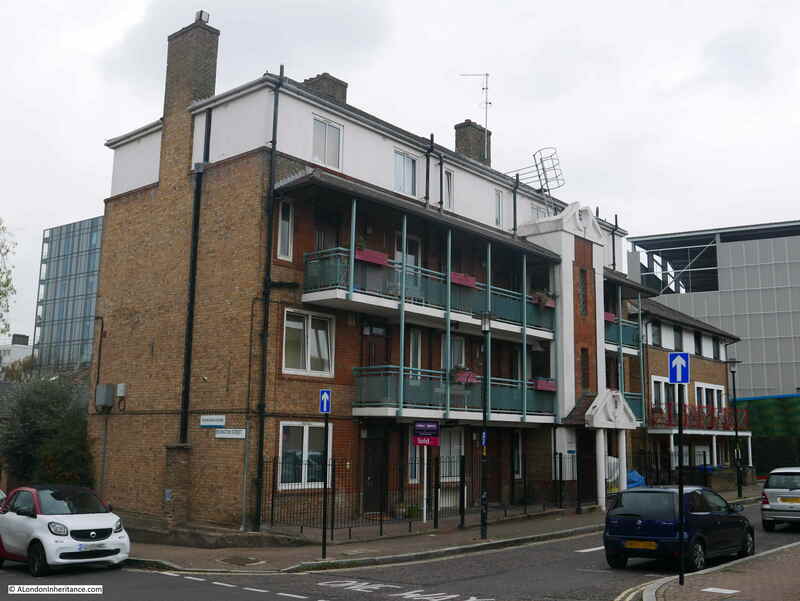 On the right is a block of flats, the first of the flats that cover the land up to where Flockton Street originally met George Row to the south. It is the design of these flats that also gave me a problem with confirming that this was the location of my father’s photo. 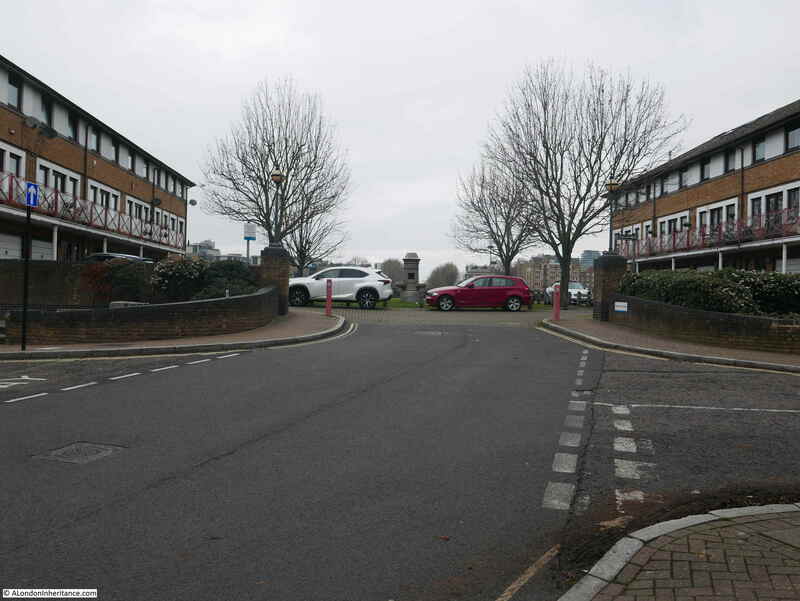 Another view of the flats is shown in the photo below, standing in the open space that would once have been Flockton Street. “Police Seek Clue From Blonde – South London police are seeking a young, fair haired girl, who, they think, may be able to help them trace 16 year-old Violet Rose Dicker missing from Weller House, George-row, Bermondsey. 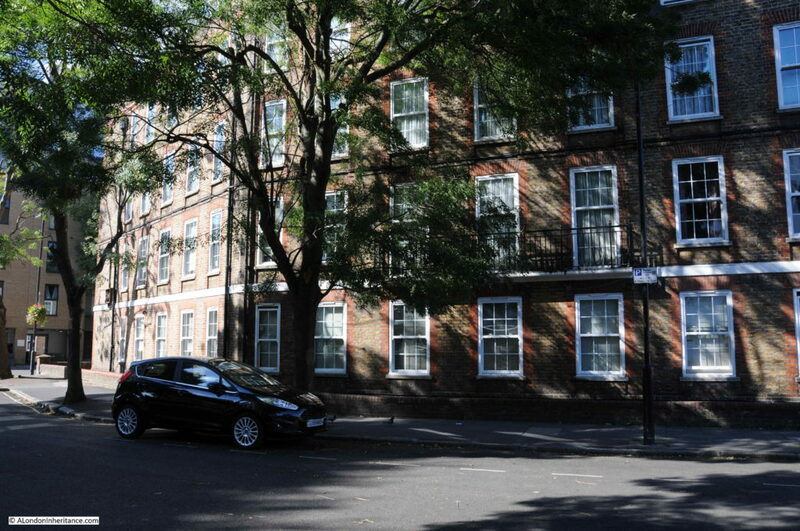 Violet is the fifth girl to disappear from Weller House, a block of flats, in six weeks. I can find no further reports of what happened to Violet Rose Dicker or the other four girls who disappeared from Weller House so no idea whether this was normal teenage rebellion, or something more sinister. This is the view of Weller House from Scott Lidgett Crescent (part of what was East lane in the 1895 map). The southern end of Flockton Street would have been through the middle of the flats, roughly where the building moves from light to shade. 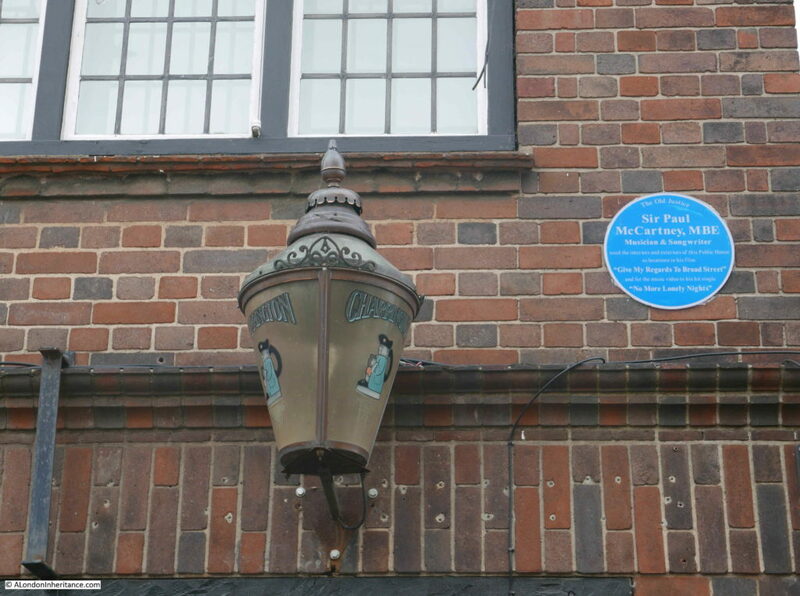 So I am still not sure whether Flockton Street is the location of my father’s photo. The notes were generally written after he had taken the original photo, often after he had developed the negatives and printed some of the photos. As I have worked through his photos, it is very rare for the written notes to be wrong, however I suspect with this photo the location may well be wrong. 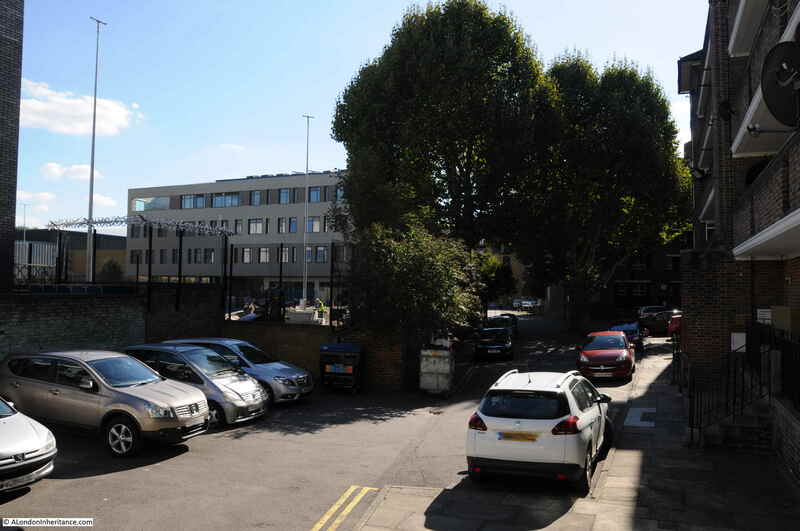 The school is in the right position, but if the view of Flockton Street is from Bermondsey Wall, the narrow section with the dip is not visible and I doubt Chambers Street was in existence in 1948 – it was not on the 1940 map. Also the blocks of flats between George Row and Flockton Street appear to be of pre-war construction, certainly those to the southern end of what was Flockton Street are pre-war. 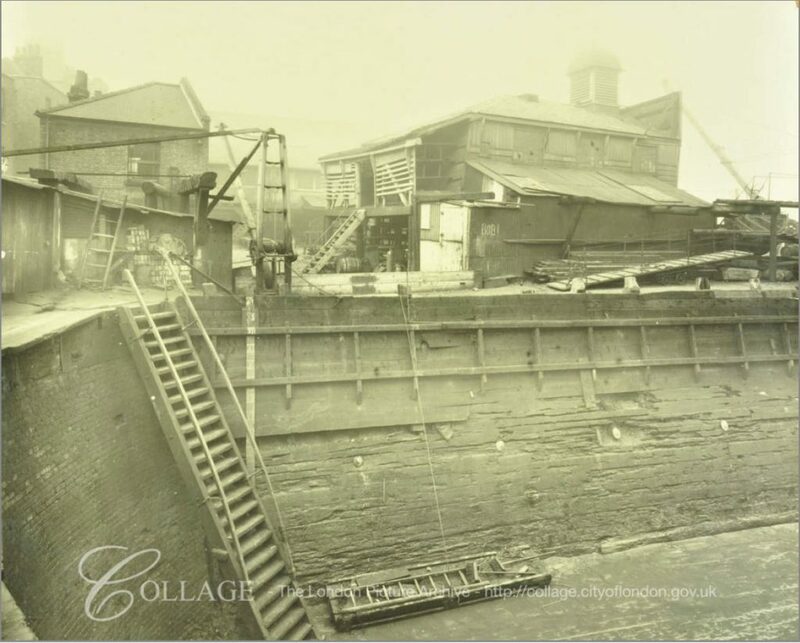 The photo is in Bermondsey, photos on the same negative strip either side of this photo are in Bermondsey. Perhaps some time spent in local archives may reveal the location, but at the moment, this is still a mystery location. 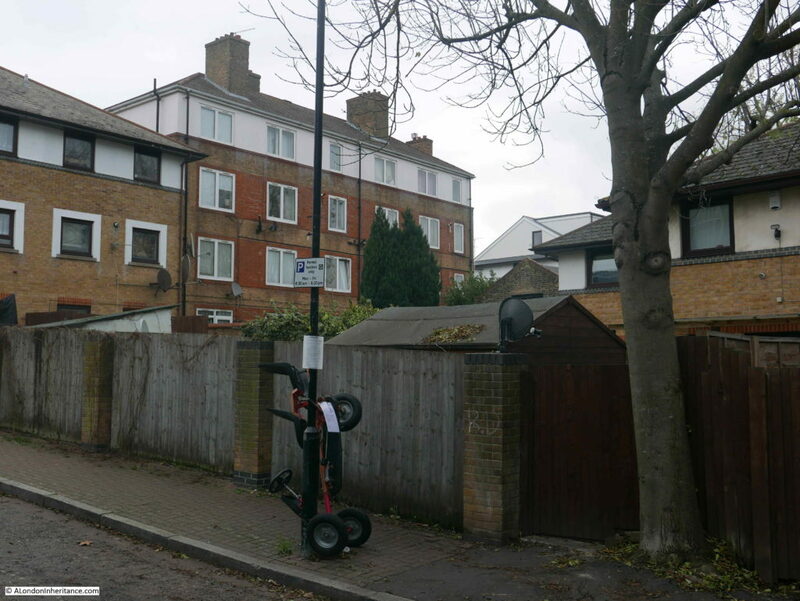 This entry was posted in London Streets, The Bombed City and tagged Bermondsey, Bermondsey Wall, Flockton Street on October 14, 2018 by admin.